Be the first to share your favorite memory, photo or story of Linda "Mimi" . This memorial page is dedicated for family, friends and future generations to celebrate the life of their loved one. Linda “Mimi” S. Muller, 65, of Freeport, died Saturday February 2, 2019, Agrace Hospice Care, Fitchburg, Wisconsin. Linda was born February 23, 1953 in Cumberland, Maryland, the daughter of Robert and Margaret (Callahan) Reichert. She married Kurt D. Muller in Cumberland, Maryland, March 20, 1976. 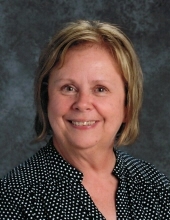 She worked for Freeport School District for 32 years, many of those years as a Librarian at Blackhawk Elementary School. She was a member of St. Joseph Catholic Church. Linda’s life revolved around her family. She loved attending her children and grandchildren's sporting and school events. She looked forward to any family outing or get together. Surviving are her husband, Kurt Muller of Freeport; two sons, Chris Muller of Aurora, CO., and Shawn (Melissa) Muller of Dousman, WI. ; daughter, Maggie (Mike) McNeive of Oak Creek, WI. ; eight grandchildren, Ryan, Ally, Danny, Molly, Kaylin, Morgan, Aidyn and Ava. To send flowers or a remembrance gift to the family of Linda "Mimi" S. Muller, please visit our Tribute Store. Visitation will be 3:00 p.m. – 7:00 p.m. Thursday February 7, 2019 at Burke Tubbs Funeral Home. "Email Address" would like to share the life celebration of Linda "Mimi" S. Muller. Click on the "link" to go to share a favorite memory or leave a condolence message for the family.